John Hayashi called yesterday and told me to get my buns up to Lake Winnebago today. So, ignoring all warnings (mostly from the Highway Patrol) Barb and I climbed into the Highlander and headed north. We ran into a white-out on the way home around Beaver Dam. 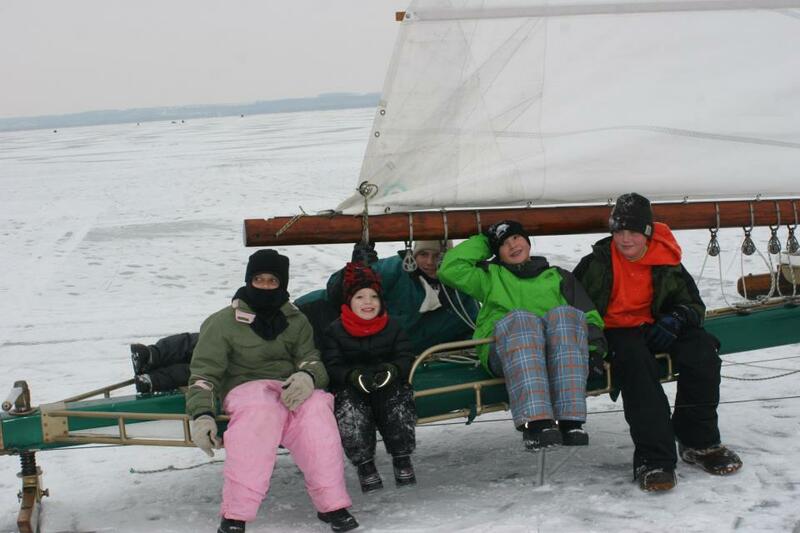 But that wasn't half the fun as a ride on the Green Lake Ice Yacht Club's Evinrude stern steerer. 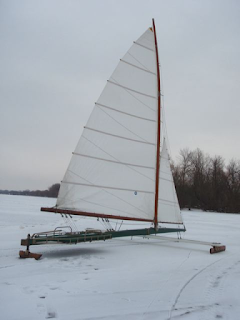 While the smaller boats from the Hudson, Ariel and Ice Queen were out running around when we got there, Jack Frost didn't go out, her skipper said it was too windy. (it was). 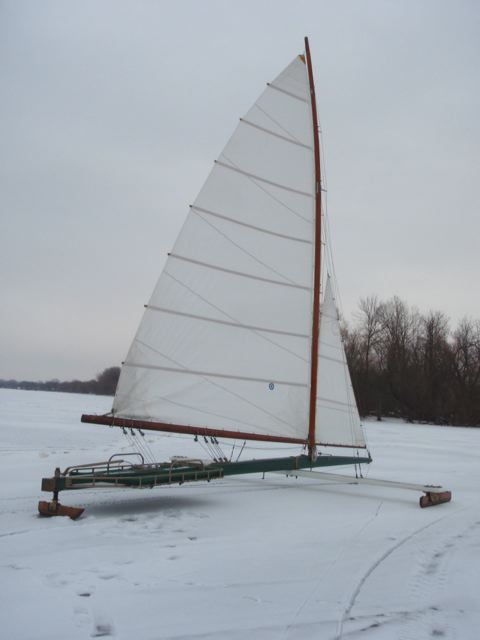 About 3/4 mile out from shore a big heave limited our sailing area to a space about twice the size of Lake Wingra. And every time we got close to that crack we disturbed the ducks and gulls who must have been lounging in the big hole just out of sight. 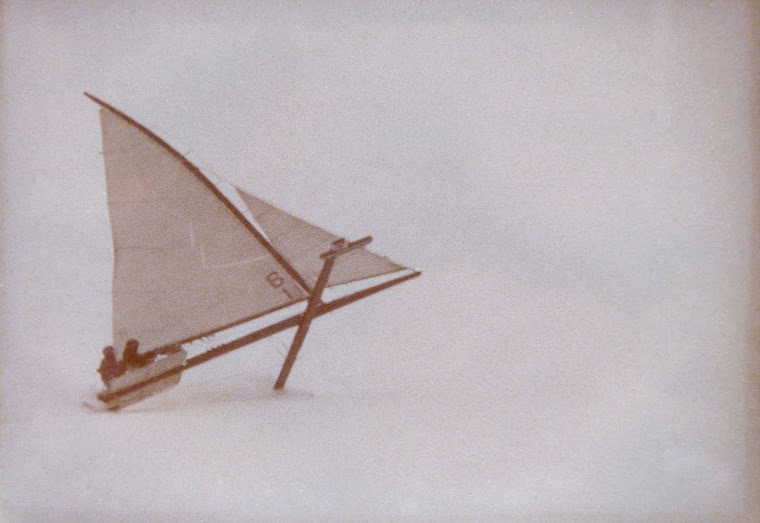 Even so, when that windward runner gets about waist high off the ice, it's quite a thrill. I would like to reaffirm that in all of the times sailing the B I had never hiked the boat for as long or as much as with Don. Nor has anyone ever trimmed block to block as much as Don. They were quite the rides believe me. One of the fun rides was with Dawn Morgan, with Todd in the background giving me the easy ride gesture and the wind really whipping up we pushed off and got the last good ride of the day. No extreme hiking or the extreme driving stunts were done but we had a good solid ride and went pretty fast. The last few weeks Dawn has been on the Skeeters sailing so this was the next progression. She did an awesome job of trimming the sail as well. Lets do it again. Thanks to Drew and Drew, Peter, Emma, Rob, Todd, Brian, Jim McCabe, Mimi and Dawn and the rest of the Morgan clan who helped get the boat over and back. The ride back was interesting as well. 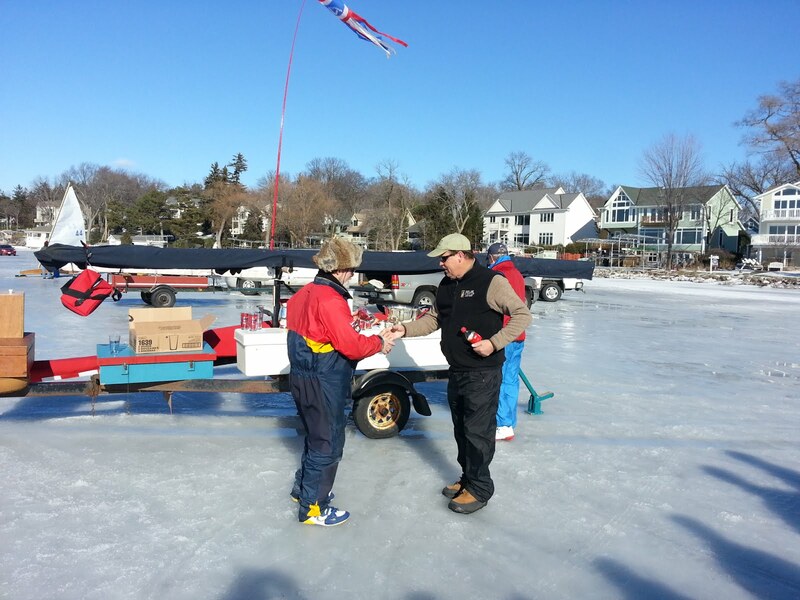 Also a shout out to all the East coast iceboaters who showed up. You guys are alot of fun and we would love to see you come out again sometime soon.